Here's a page from a recent freebie flyer we got in the mail. 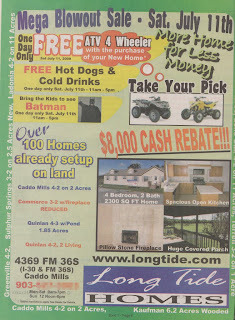 As you can see, it's advertising a blowout sale at a manufactured home dealer, Long Tide Homes. The thing that brought my attention to this ad was the fact that Batman was making an appearance at the sale. This is the same Batman, complete with the black power salute, that has been showing up all over the place in northeast Texas this year. See the Gallery entries for February 8th and May 19th. Batman! Fighting the injustices of high prices so that you, concerned citizen, can more easily consume!